Commentary this morning about the Commissioner's position on the anthem is not accurate," said the league. "As we said yesterday, there will be a discussion of these issues at the owners meeting next week. The NFL is doing the hard work of trying to move from protest to progress, working to bring people together....Players from around the league will be in New York next week to meet with owners to continue our work together." Trump tweet aside, which is in error, the NFL commissioner, said everyone should stand for the Star-Spangled Banner. Yes, they will have further debates within the league. Yes, there is no formal policy of enforcement, but that acknowledgment is still a win. It began with former 49ers quarterback Colin Kaepernick. He decided to sit and then take a knee during the national anthem. It was controversial then, and it’s controversial now. Then, President Trump decided to weigh in, saying the act was disrespectful to the flag and to our country. He went a little further, adding that the players who engaged in such antics should be fined, suspended, or fired. I think that’s a bridge too far, but there is no doubt we have a cheerleader for America in the White House. We’re still fighting a war in Afghanistan. You stand for the national anthem—end of subject. The NFL, the owners, and the player association—all went on the freedom of speech bit and how they supported their players. More players took a knee. The NFL was going to war with Trump. They took the bait; bad, bad move, boys. 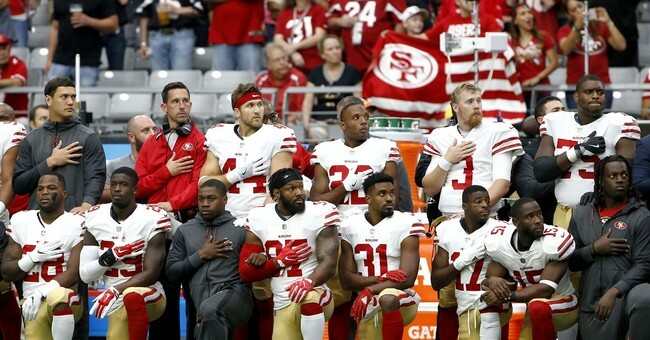 Third week ticket sales plummeted by nearly 20 percent, 34 percent of Americans were less likely to watch football because of the protests, and approval for the league dropped as well. Since the anthem protests, owners saw the data. Yes, Trump was right; these antics were torpedoing the NFL’s ratings and the teams’ bottom lines on their balance sheets. There was a surge in refunds from ticket holders. It doesn’t take a genius to figure out why. Fans thought it was disrespectful to the flag, to your troops, and to our veterans. Seventy-two percent thought Kaepernick’s antics were unpatriotic. And that’s the game right there. Free speech matters, but it’s irrelevant here, as is any issue these players were trying to highlight. When you come off as an unpatriotic piece of crap, everything you stand for suffers. Period. Now, does this mean penalties or fines will be instituted? No. But it’s surely a sign that the league knows it screwed up. For the social justice warriors of the country, here’s a pro-tip—don’t protest that Star-Spangled Banner. Optics are everything and this is a one-way ticket to a PR disaster. ESPN’s Stephen A. Smith admitted that Trump is winning this war. "In the end, what it really, really comes down to is the president has successfully hijacked this issue," Smith said on "First Take," explaining that the original purpose of the anthem protests - highlighting racial inequality and police brutality - has been lost. "He's turned it into an issue about patriotism and beyond. He's catering to his base in the process," Smith said. "He is the one that's winning because he's turned this into something that the players didn't intend to. So they're going to have to find a different mechanism to make their voices heard, because Trump has won this round." Now, he didn’t hijack anything. In fact, this wouldn’t be an issue if players just stood for the anthem and then used their social media to raise awareness bout these social issues on their own time. They would have given a big enough spotlight on racial inequality or police brutality. All people see is a bunch of ungrateful athletes making big money, poisoning the game with their unpatriotic antics. That may not be fair to some—but that’s how it looks. And that’s always going to be a losing battle. I don’t think there are multiple rounds here. I think the war is over—and Trump has won. He won before even a shot was fired.